Why employ a canine? | How is K-9 Sweeps LLC different? | What breed of dog do you use? Where will the Bed Bug canine detectors look? | How does the dog alert you? What happens if there is Bed Bug activity? | What type of documentation do you provide? How often do I need to inspect for Bed Bugs? How does K-9 Sweeps LLC charge for service programs? | Is your work guaranteed? Why should I employ a Bed Bug detecting canine team? Dogs work for food and love, not profits. They operate in an incredibly efficient manner, being able to accurately identify and pinpoint Bed Bug harboring sites. Hotel rooms can be examined for Bed Bug eggs in a matter of three to four minutes per room. A human inspector can take up to one hour per room. Scent dogs are known to be over ninety percent accurate, as opposed to visual inspections by humans, who fall in the thirty to forty percent accuracy range. In addition to being a more cost effective option to identify Bed Bug infestations, K9 sniffing dogs deliver peace of mind. Living with Bed Bugs can be a horrific and uncertain experience. If a Bed Bug dog “alerts” you to the presence of Bed Bugs, you can move forward confidently with a Bed Bug treatment plan . Finding your property “alert free” of Bed Bugs will re-confirm a belief that your dorm, barracks, school, resort, hotel or home is Bed Bug free at the time of inspection. 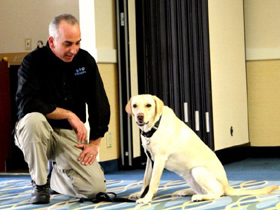 Use of Bed Bug detecting canine teams is the most accurate means available to detect Bed Bugs. How is the Bed Bug detecting canine team at K-9 Sweeps LLC different than other K9 inspecting dogs? Great question! There is a huge difference between our canine’s and the dogs at other companies. It is not IF a company has a Bed Bug detection dog, but HOW they train, care and handle that canine which determines service quality. I KNOW WE ARE IN VEGAS BUT, DO NOT GAMBLE WITH YOUR BRAND! First and foremost, WE ARE A LICENSED AND INSURED BED BUG PEST SOLUTION COMPANY! We are also canine handlers who spend all of our time training our canines. Our canine service is available to identify, prevent and provide synergy to your current pest management program. Regular, scheduled and documented canine sweeps will reduce your exposure to Bed Bug infestation and litigation. Our motive and mission is early detection, expedited source identification and to oversee and enhance your treatment protocol. Secondly, our clients are assured a clean, healthy, high energy and accurate Bed Bug detecting canine. Our handlers follow an incredibly rigorous schedule to insure the team you hire is efficient and confidently effective. The canine’s training schedule is documented and reported daily to insure quality. Regular conditioning provides the underpinnings for a successful inspection. For example, a Bed Bug sniffing dog’s effectiveness can be hindered if their teeth are not routinely brushed! Plaque, cavities and dental problems can affect the dog’s nasal cavity! Our dogs are combed, bathed and have their teeth brushed regularly to galvanize a healthy hygiene concept. To keep the dogs sharp we test them every day! Two times a day they identify Bed Bugs on a scent discrimination wheel containing live Bed Bugs, carpet fibers and plaster. Once a day Bed Bugs are hidden in a home and the canine must locate their harboring site. Daily cage training ensures the canine will be quiet and discreet during the inspection process. An hour of physical fitness training keeps the animals in shape to work the long hours required to detect cryptic living Bed Bugs. Last, but not least, our Bed Bug detecting canine’s were trained for six hundred to eight hundred hours by certified master trainer (CMT) Bill Whitstine, of the Florida Canine Academy, BEFORE they arrived at our Vegas location! Bill has been featured on the Today Show, Animal Planet and The Discovery Channel. He trains bomb, drug, money weapons, termite, mold and accelerant detection canine teams. Bill is a leader in the field of canine training since 1989. He was the first person to attend a Maine State Police Canine Academy in Accelerant Detection and authored a book on accelerant detection canines. Bill is the founding member of the international Canine Accelerant Detection Association and Termite Detector Dog Association. He trains all of our canine handlers to work in harmony with our beloved canines. What breeds of dogs do you employ to detect Bed Bugs? K-9 Sweeps employs Labradors / Labrador mix breeds which are part of the sport breed of dogs. Sport breed dogs are known for their exceptional ability to track the scent cone, that is tracking airborne scents to its origin. Where will the Bed Bug K9 detectors attempt to seek out Bed Bug activity? The handler and canine will examine the entire area. Areas of particular interest will include behind bed headboards, mattress, box spring, bed frame and night stand. This is inclusive of lamps, telephone and other potential harborage sites. Carpet edges and baseboards are considered “hot spots” for Bed Bug Activity. Ninety percent of Bed Bug activity is found around where the host sleeps. We have identified activity in toasters and coffee makers! It is essential to be thorough. How does the dog “alert” for the presence of Bed Bugs? Our canines are trained to be discreet and very quiet. Depending on the type of “alert” our canine will sit and then on a different command will point with its nose. They are trained not to scratch, bark or engage in any invasive behavior. What happens if the canine “alerts” to Bed Bug activity? We will perform a visual inspection to identify the type of infestation that may be present. If your property is multi-unit we suggest you take the room out of service immediately. Rooms above, below and diagonal to this room should be made available for examination. All alerts will be documented and we will be happy to work in conjunction with your pest management firm, or we can handle the situation for you, in working towards a resolution. Instead of “spray and pray” we can “seek and destroy”! What type of documentation do you provide to your clients? Depending on your budget K-9 Sweeps LLC can provide you with basic reporting methodology or go as far as bar coding every room, at a multi-unit dwelling, for quality assured reporting. Our software is internet based and clients can access reports almost immediately. Embracing this latest technology has assisted companies in early detection, documenting historically troubled areas and reducing exposure to litigation. All our programs are customized to meet the needs of discriminating clients. Certain programs permit access to pay invoices and view maps, charts, graphs etc. K-9 Sweeps LLC is a very flexible and nimble organization. After meeting at your home or business we will conduct a FREE, NO OBLIGATION needs analysis. Based upon the amount of visitors to your facility, frequency of your pest management visits and size of your location we can then customize a program to meet your special needs. How does K-9 Sweeps LLC charge for service programs? Again, we are very flexible and customize every program to meet the needs of our most valued clientele. Program customers can invest by the room. In many instances we charge an hourly rate or some combination of both. Please contact us to discuss our investment structure in detail. K-9 Sweeps offers a service warranty and the results of any inspection are based on the canines keen sense of smell and educated interpretation of the handler. Results are close to 100% accurate at of the time of inspection. Due to the transient nature of Bed Bugs we cannot guarantee anything beyond the time of inspection and our examination does not apply to areas not inspected due to obstruction. We cannot report the status of inspection in any areas that were not readily accessible.